We recommend our safety guard screen for restaurants and other high traffic areas. Use at home for extra protection for curious children or pets. Easily slides forward to add wood. 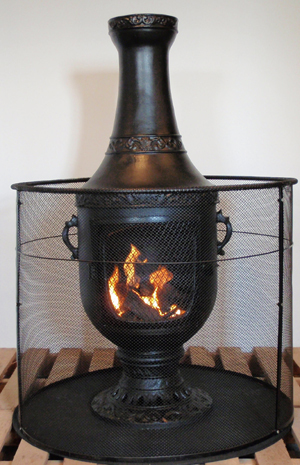 Treat your chiminea just as a BBQ grill, using the common sense associated with wood burning. Made from three heavy duty sections that dissassemble for easy storage. 36" diameter and 30" tall.